Background: Operational tactics in urban areas are often aided by information from unmanned aerial vehicles (UAVs). A major challenge for dismounted soldiers, particularity in urban environments is to understand the conflict area in general and particularly from the UAV feed. The UAV feed is usually used to enhance soldiers’ situation awareness abilities but less for identifying specific elements. 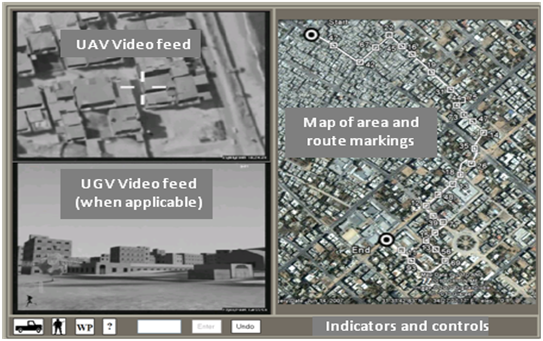 Objective: A possible way to further enhance soldiers’ abilities is to provide them with multiple sources of information (e.g., aerial and ground views). This study examined the benefits of presenting video feed from unmanned aerial and ground vehicles (UAV/UGV) in a combined interface, relative to presenting aerial feed alone. Method: Thirty former infantry soldiers with no experience in operating unmanned vehicles participated. Objective performance, subjective evaluations and eye tracking patterns were examined, in two separate scenarios. Results: In Scenario one performance scores in both Identification and Orientation tasks were superior in the combined configuration. In Scenario two performance scores in the Identification tasks were improved and the addition of the UGV feed did not harm performance in the Orientation task. 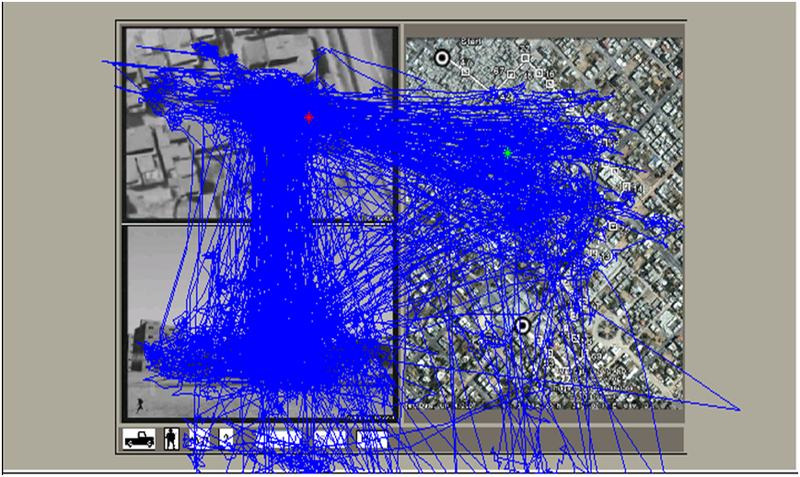 Eye movement scanning patterns reinforced that both UAV and UGV feeds were used for the mission. Conclusion: The combined configuration generated consistent benefits with regard to the Identification tasks, perceived mental demand, and reduction of false reports without having any apparent cost on participants. Application: Ground views may provide additional support to dismounted soldiers. The full article appears in the Journal of Cognitive Ergonomics and Decision Making. Here is a sample video feed of the eye scanning pattern of a single participant derived from Scenario 2. Note how the participant utilizes the C2 map (to the right) and both video sources. Passive Operators\Information Consumers differ from operators and need special attention and interfaces to support their operational missions. Here are two images from the current study: one of the interface and one of the scanning patterns of a sample participant. From the scanning pattern it is notable that the stronger routes are between the UAV and the map and the UAV and the UGV feed. This entry was posted on February 22, 2012, 19:29 and is filed under Military & Law Enforcement Applications, UAV. You can follow any responses to this entry through RSS 2.0. You can leave a response, or trackback from your own site.